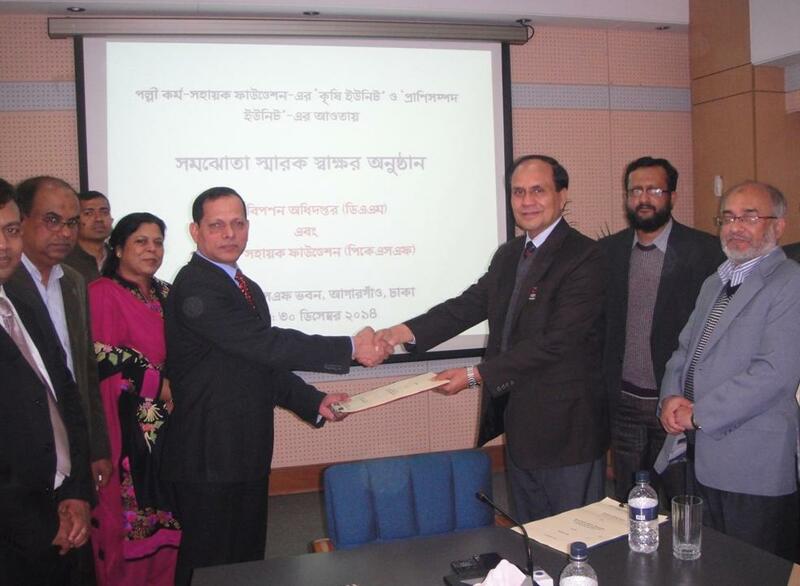 A Memorandum of Understanding (MoU) has been signed between Palli Karma-Sahayak Foundation (PKSF) and Department of Agricultural Marketing (DAM) on 30 December 2014 at PKSF Bhaban under its `Agriculture Unit’ and `Livestock Unit’. Mr. Golam Touhid, Deputy Managing Director (operations) and Md. Mahabub Ahmed, Joint Secretary, Director, signed the MoU on behalf of respective organizations. Mr. Md. Abdul Karim, Managing Director of PKSF, was present in the occasion. Besides, Mr. Fazlul Kader, Deputy Managing Director of PKSF and other members of PKSF’s higher management were also present in the occasion. DAM is one of the oldest Government Department which deals with marketing of agricultural commodities. Objective of this MoU is to help the framing community in PKSF’s working area with cooperation from DAM to facilitate proper marketing of their products through dissemination of market information, training farmers – on product quality, handling, processing, storage, transportation. Another Memorandum of Understanding (MoU) has also been signed between Palli Karma-Sahayak Foundation (PKSF) and Department of Fisheries (DoF) on 29 December 2014 under ‘Agriculture Unit’ and ‘Livestock Unit’. 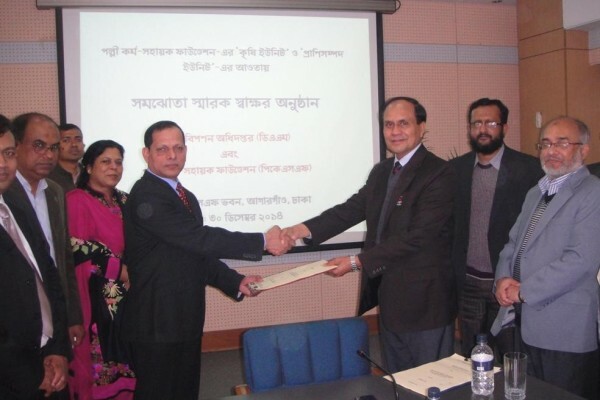 Dr. Jashim Uddin, Deputy Managing Director (Admin & Finance) and Dr. Syed Arif Azad, Director General, Department of Fisheries (DoF) signed the MoU on behalf of respective organizations. Objective of this MoU is to assist the fish farming community of PKSF in enhancing fish production through technological intervention, ensuring quality fry and improved aquaculture management practice. It is worthwhile to mentioned that, PKSF has established ‘Agriculture Unit’ and ‘Livestock Unit’ in FY 2013-14 for extending agricultural technologies and other services to farmers with a view to increasing agricultural production as well as ensuring food security. The core goal of these units is to enable the farmers to gain access to resources necessary for agricultural production, employment generation and for enhancing the quality of their lives through agricultural activities. The salient objectives of these units are to assist providing microfinance services considering the seasonality of agricultural activities; to provide useful, modern and environment friendly agricultural technologies; establish market linkages of agricultural commodities; and to develop skilled manpower at PKSF, PO and participant level. These units will undertake various activities within the purview of financial and administrative capacity of PKSF as a supplementary and additional service provider of the Government.